Last week I was in Houston loving on my 5yr old niece, Nettie. Part of our daily routine was to get on the school bus at 6:40 AM every day. So, picture this . . .
We’re sitting in the car at the end of the driveway. Our flashers are on so the bus driver knows we’re waiting for him. And, Nettie is pushing every single button and turning every single knob in the car. Aunt Jen whips out her bag of tricks. Today, that trick is Snapchat. Chaos ends and we spend 10 glorious minutes playing with filters. It was a special time I want to remember and I want her to remember it too. 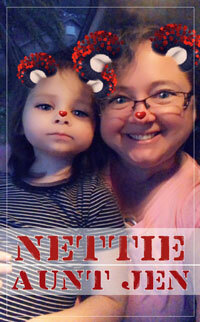 So, I quickly put together a photo for Nettie’s wall using Jenifer Juris’ newest Qwik Tutorial on the blog. I can’t wait for her to come home from school and see it. I LOVE being Aunt Jen! Not enough time in your day to create a complete scrapbook page? Maybe you have enough time to overlay a photo and send it to someone you love. Getting mail is one fantastic way to tell someone you’re thinking of them. With just the use of a stroke outline and the brush tool, your title will have an authentic stencil look. There’s something irresistible about impeccably crafted type and attention-grabbing word art. Master the secrets of terrific type with this popular class by Jenifer Juris. Lifetime Premier Coupon holders – use link in the classroom for additional savings.